Comments: William 'Willie' Edward Burgess and his wife, Ellen Gentry (Cornett) Burgess, posed for these portraits taken by Willie at Idylwood shortly after their marriage. For the past 100 years, these two hand-tinted portraits have hung side-by-side in the Burgess family home. William 'Willie' Edward Burgess, photographer extraordinaire, was born on July 10, 1871, at Locust Grove, the Burgess family plantation on the Hardware River between Fork Union and Scottsville, Virginia. 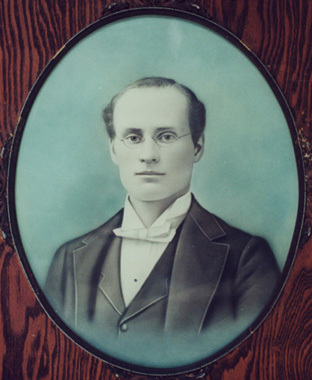 He was the son of Pleasant Morgan Burgess (1833-1906) and Sarah E. (Clark) Burgess (1838-1913). 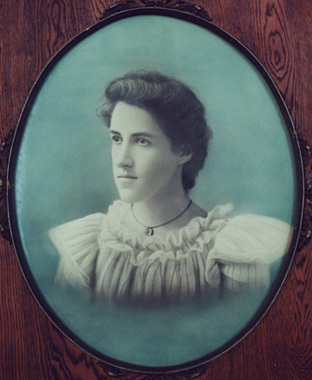 Willie married Ellen Gentry Cornett on October 4, 1899, in Elk Creek, Grayson County, Virginia; Gentry was born on April 17, 1872, in Elk Creek and was the daughter of Judge George W. and Sarah Jean (Gentry) Cornett. Willie and Ellen Burgess lived at Idylwood near Scottsville and were the parents of the three boys shown in the photo at right: George Gentry, William Harold, and Laurence Edward Burgess. Gentry Burgess died on July 13, 1912, and is buried in the Burgess family cemetery at Locust Grove, Fluvanna County, Virginia. Shortly thereafter, George, their son, died tragically on December 19, 1913. Willie Burgess was deeply saddened by the loss of his wife and son. He retained a housekeeper, who was also his photographic assistant, to help him raise his two sons and remained a widower for the rest of his life. While on a photo shoot in Gretna, Virginia, Willie Burgess died of a heart attack on July 2, 1935. He is buried beside his wife, Gentry, and son, George, in the Burgess family cemetery in Locust Grove, Fluvanna County, Virginia. Shown below are photos of Laurence, George, and William Harold Burgess, sons of Willie and Gentry Burgess. Laurence was born in February 1901, and later was a track star and a 1920 graduate of Scottsville High School. He married Stuart Meredith. George was born September 9, 1903, in Prestonsburg, Kentucky, and died at Idylwood in 1913. 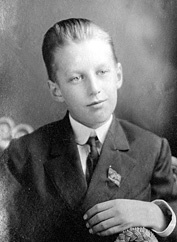 The 1910 photo of William Harold was taken in his father's Idylwood Studio; he was born June 27, 1907, in Scottsville at the Burgess family's Idylwood home and died in 1998. He married Blair Christian Clark. 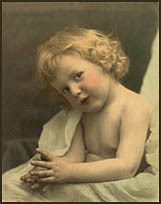 The first five photos were provided by Rita and William Burgess of Palmyra, Virginia; William is the grandson of William 'Willie' Edward and Ellen Gentry (Cornett) Burgess. The photo of William Harold Burgess at lower right is part of the Mayor Raymon Thacker Collection.